Toilets are an integral part of any bathroom. Whether you’re in the midst of a remodel or your old toilet is leaking and needs replacing, you’ll be faced with several options when choosing a new bathroom fixture. Toilets come in many shapes, sizes, and styles, including one-piece and two-piece toilets. Traditionally, toilets were made with a tank and bowl bolted together, and some are still sold this way. However, recently one-piece toilets have become an option. Both toilets function well, and manufacturers provide the same design in a one- or a two-piece model. We’ll outline the differences below so that you can make a better choice for your home. Both one-piece and two-piece toilets come in a range of sizes. Traditionally, most one-piece toilets take up slightly less space due to the way they are designed. The tank and bowl are molded together so that they don’t need as much room, front to back or in height. However, most one-piece toilets are designed to comfort height guidelines, which means that the bowl sits at 17 inches, rather than 15. Two-piece toilets can be found in both standard and comfort height, and both toilets are available in sizes to accommodate various bathroom designs. When choosing a toilet, the most important measurement is the rough in, which is the distance from the center of the drain pipe to the wall behind the toilet. Most toilets sit at 12 inches, but some have a 10- or a 14-inch rough. Two-piece toilets have more options for sitting on a differently sized rough because the bowl size doesn’t change. Simply order a different tank to sit on top. A few one-piece toilets offer the ability to have a moveable rough to accommodate different bathrooms. So, if you have an odd-sized rough, you have more options with a two-piece. One-piece toilets are considerably heavier. This is because a two-piece can be uncoupled to move, halving its weight, while a one-piece contains everything in one mold. Moving it can be more difficult, and shipping costs may be considerably higher. Both one- and two-piece toilets are available in a wide range of styles. Because of the sleeker appearance of a one-piece, some people feel that they are better in contemporary bathrooms. However, you can find one-piece toilets with traditional designs as well as modern two-piece toilets. Installation is fairly similar for both types of toilets regarding difficulty. A two-piece toilet is going to be easier to move and maneuver, but it needs to be bolted together. A one-piece toilet is harder to move but doesn’t need to be assembled. In both cases, to install the toilet, a wax ring is placed over the waste pipe. The toilet is set on top of the ring at a slight angle then twisted sharply to face front. The installer sits on the toilet and leans front to back and side to side to evenly distribute the weight. The toilet is then bolted to the floor, and the bolts are concealed either in the toilet skirt or with bolt caps. The water line is hooked up to the bottom of the tank and sealed. The water is turned on, and the toilet is allowed to fill before being flushed to check for leaks. This takes less than an hour. Traditionally, one-piece toilets cost more, even with the same manufacturer and style. A Kohler Memoirs Stately Comfort Height toilet in two-piece costs about $500, while the same toilet in one-piece costs about $1,250. Both have the same lines, front to back measurement, and bowl height. The one-piece version is slightly shorter. Both have the same flushing technology. Installation for each toilet costs around $100. So, a one-piece toilet will cost between $900 and $1,350 with installation while the two-piece costs between $300 and $600. One of the reasons for the popularity of one-piece toilets is the lower maintenance. The molded shape of the toilet makes a one-piece easier to clean because there is less space for bacteria to become trapped and breed. One-piece toilets have a slight advantage regarding durability. The coupling between the tank and bowl of a two-piece toilet may crack over time. This means that the two areas could uncouple, requiring replacing one or both pieces. In very old toilets, the rubber gasket between the two sections may degrade, which can cause leaks. This is an easy and inexpensive fix, however. One-piece toilets are molded, so there is less chance of breakage between the couplings. However, if something breaks in the tank section of the toilet, replacing the entire toilet is necessary. With proper care, either toilet can last 50 or more years without requiring replacement. Both one-piece and two-piece toilets are available in a wide range of different flushing technology, from flappers to towers. Both are also available in low-flow versions, which use as little as one gallon of water per flush. Neither toilet design has any impact on the resale value of a home. However, having a working toilet that does not leak is part of what helps maintain a home’s value. It’s important to have a working toilet, regardless of type or style. 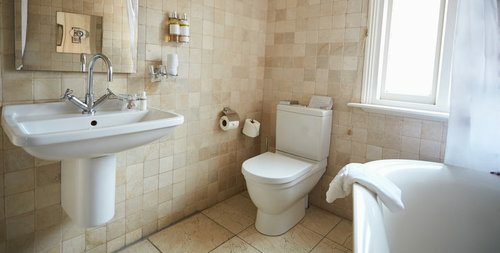 How much does it cost to install a one-piece or a two-piece toilet in my city? Cost to install a one-piece or a two-piece toilet varies greatly by region (and even by zip code). To get free estimates from local contractors, please indicate yours.